The IT industry has seen dramatic shifts over the past few years in ways in which software applications are developed and deployed. The rise of cloud computing, automation, virtualization has fundamentally changed how developers, system administrators, and businesses manage infrastructure as a whole. It would seem impossible to run critical applications outside the boundary of the corporate data center few years back. However, to keep up with the current pace, organizations are now migrating their infrastructure to cloud services such as Google Computer, Azure and AWS in an effort to not only save time but cut overhead costs. Since then organizations have started to focus on things that actually matter such as containerization. It started in 2013 with the initial release of the Docker container engine which would allow users to conveniently and effectively package software into small, reusable environments known as containers. Since then businesses started using containers to package legacy applications in order to simplify deployment and increase portability. The idea behind Docker was to pack an application with all the dependencies it needs into a single, standardized unit for the deployment. To better run a modern cloud infrastructure, a better understanding of both Docker and Kubernetes is essential. We intend to provide the same through this article and help you understand the difference between the two. Kubernetes is an open-source project and ecosystem that automates the deployment, scaling and management of containerized applications. It is one of the most popular orchestration platforms in the world for automating deployment and management of container-based applications at both small and large scales. Search giant Google open-sourced the Kubernetes project in 2014, but it later joined the Cloud Native Computing Foundation (CNCF) and became the undisputed leader in the field of container-based applications. Kubernetes revolutionized the way DevOps and IT infrastructure are handled. One can easily run containerized applications across multiple clustered nodes using Kubernetes. 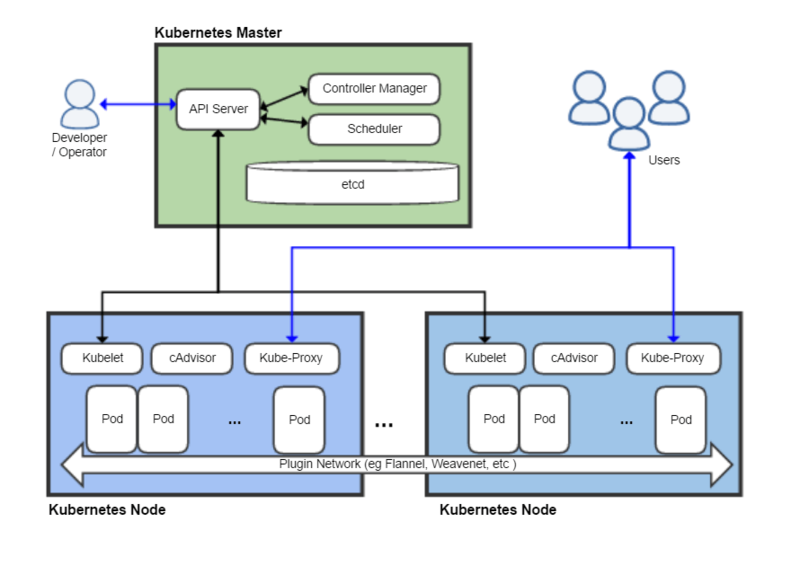 The Kubernetes orchestration includes scheduling, distributing workload, and scaling. It is the software for managing a cluster of Docker containers. Docker is an enterprise-ready container platform and open-source engine that automates the deployment of applications into containers. Docker was designed as the internal tool in the platform as a service company, dotCloud. It was released to the public as open source in 2013. Its source code is available for free for everyone on GitHub. Docker adds an application development engine on top of a virtualized container execution environment. 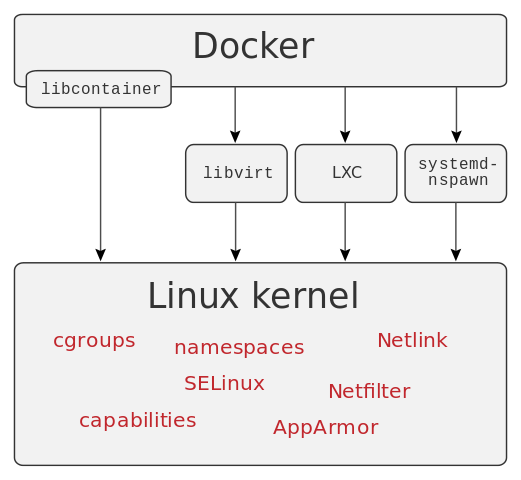 In simple terms, Docker is a technology for Linux that allows system developers to package an application with all the parts it requires. It is lightweight and incredibly simple and is designed to enhance consistency by making sure the environment in which the developers write code matches the environment into which the applications are deployed. Both Kubernetes and Docker are comprehensive de-facto solutions to effectively and efficiently automate deployment and management of container-based applications allowing developers to package an application with all the parts they need. However, both are fundamentally very different technologies that work in harmony. Docker is an enterprise-ready container platform for building, configuring and distributing Docker containers, whereas Kubernetes is an ecosystem for managing a cluster of Docker containers known as Pods. Kubernetes comes to picture when you need to work with a large number of containers across multiple machines. Docker uses its very own native clustering solution for Docker containers called Docker Swarm, which is a cluster of Docker hosts onto which you can deploy services. Swarm has a simple architecture which clusters together multiple Docker hosts and serves the standard Docker API on top of that cluster. This makes integration with tools that already support the Docker API easy. Kubernetes, on the other hand, is an orchestration tool that follows a client-server architecture, but unlike Docker, it’s not a complete solution and uses custom plugins to extend its functionality. Docker Swarm is based on the concept of Pods which are scheduling units containing multiple containers in the Kubernetes ecosystem and are shared in a cluster of nodes automatically if available. The load balancer is deployed on its own single node swarm when pods in the container are defined as service. In Kubernetes, load balancing comes out of the box because of its architecture and it’s very convenient. Services have an integrated load balancer that distributes network traffic to all Pods. You have the option to automatically create a cloud network load balancer while creating a service. Docker relies on a copy-on-write model so that making changes to an application is also incredibly fast and only what you want to change will be changed. It also encourages service-oriented and microservices architecture where an application or service is represented by a series of interconnected containers. This makes it easy to distribute, scale and debug your applications, making deployment quick and easy. Kubernetes’s core functionality is its ability to schedule workloads in containers across a scalable Kubernetes-based infrastructure with efficient resource utilization. While both Kubernetes and Docker are comprehensive de-facto solutions to effectively and efficiently automate deployment and management of container-based applications, they are fundamentally very different technologies. Docker aims to reduce the time cycle between code being written and code being tested, deployed, and distributed. Docker encourages service-oriented and microservices architecture and uses its own native clustering solution called Docker Swarm. Kubernetes, on the other hand, comes to picture when you need to work with a large number of containers across multiple machines. Sagar Khillar. "Difference Between Kubernetes and Docker." DifferenceBetween.net. 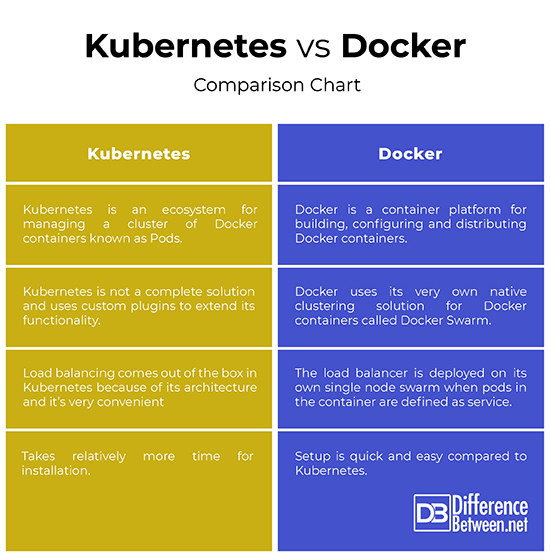 January 10, 2019 < http://www.differencebetween.net/technology/difference-between-kubernetes-and-docker/ >.